It’s true. I’m a sucker for embroidered pomegranates! The pomegranate has been around in the art world as a symbol for centuries upon centuries, thanks, most likely, to Proserpina, who couldn’t keep her little paws off those tiny seeds. It’s one of those symbols that pops up unexpectedly in art and textiles, across cultures, religions, geographical regions, artistic eras and styles. Why the appeal for so many centuries? Most likely, because the pomegranate is a symbol of new life, and therefore, of hope. I’ve always loved them. Not necessarily the fruit itself – though, when I was a kid, it was the zenith of “exotic” to actually have a real pomegranate, to open it and pick out those little tart, crunchy, juicy jewels from the innards of the thing. The fruit is abundantly available now, but it used to be pretty scarce when I was a kid in the 80’s. I love coming across the pomegranate in art and textiles. Its symbolic presence has such a long and rich history – it’s one of those connecting threads that ties thousands of years of art together. I’m always on the lookout for pomegranates! So it’s probably not unusual that the Modern Crewel kit I’m working on now appealed to me – after all, it’s another pomegranate! And with pomegranates, come seeds. Today, I’m going to show you the seeds on this one, discuss a mistake and share a tip, and then we’ll take a pomegranate tour! 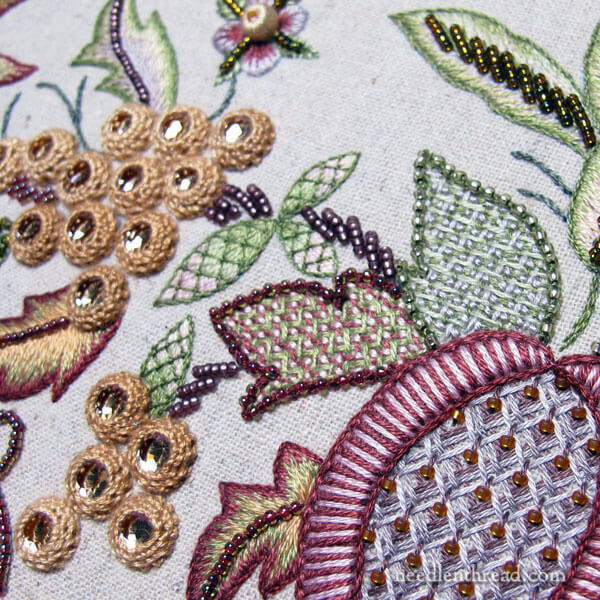 The seed area on the pomegranate in Modern Crewel features a lattice or trellis area, filled with seed beads. This is a fairly common approach to this style of pomegranate, and I love it! It works! Seed beads are perfect pomegranate-seed-mimics. With this kit, I didn’t realize that it’s really important to space the lattice work similarly to the original design – no more than seven lines in either direction. If you end up with eight, and any extra openings for beads, you’re pretty much sunk. I used exactly the number of beads supplied in the kit to fill this area. The first time I spaced the lattice threads, I had seven lines in one direction and eight in the other. Besides looking wonky, it was really too crowded for the beads. So I snipped the threads and started again, being very careful to land at seven lines in both directions. If you’re afraid of running out of beads in this type of kit, in this type of application, just space the lattice area a little more openly. It won’t make any difference in the finished piece – it just won’t be as crowded in the center beaded area. In retrospect, I wish I had opened up that lattice area a bit, so that the criss-crossed threads were more noticeable and there was a little breathing space in there, to see the beads and the threads. I haven’t gotten back to Modern Crewel yet this week, but it’s on my list for this weekend. I’d like to get the pomegranate completely finished, work the other two stems, and work all the leaves. That’s the plan – we’ll see if it pans out. 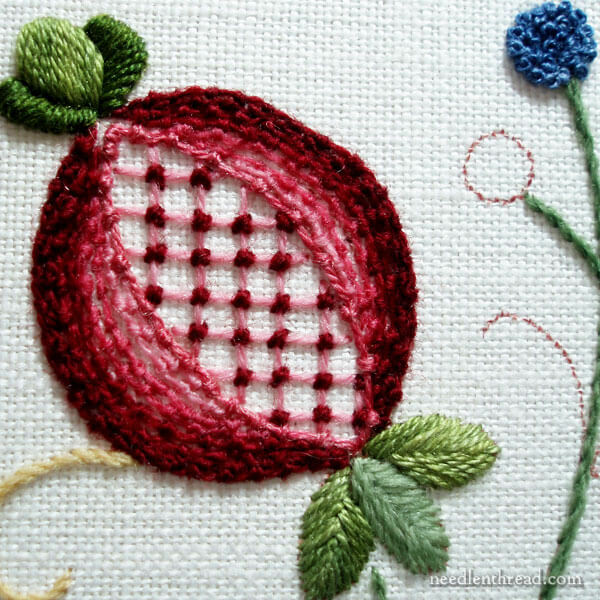 Embroidered pomegranates have shown up here on Needle ‘n Thread quite a few times over the past 10.5 years. For example, there’s this one, worked in silk and goldwork threads. This was designed by Margaret Cobleigh and featured in Inspirations Magazine #61. You can read about it here and what I did with it, if you’d like to know more about it. This is a stylized pomegranate, also worked in silk and gold, which I wrote about step-by-step. 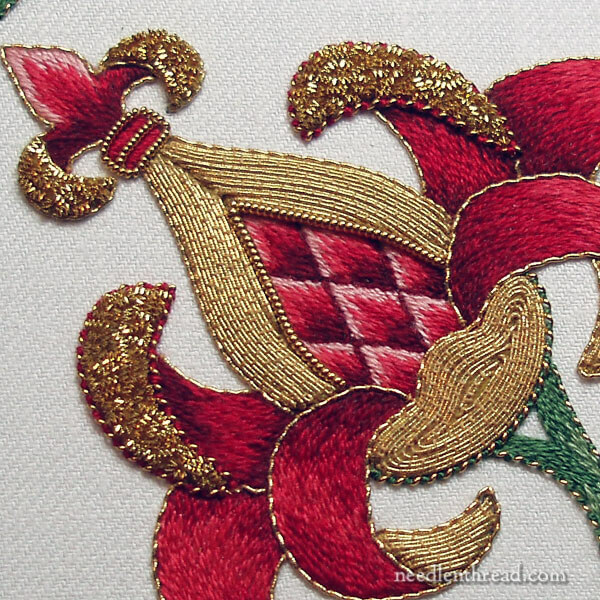 You can find all the articles related to this one – including patter, materials, techniques, and stitching instructions – in this Goldwork Pomegranate Project index. And we can’t forget the pomegranate in Late Harvest, designed by Hazel Blomkamp. I blogged about my progress on this project, too, and you can find all the details related to it in the project index for Late Harvest. I almost forgot about this little fellow! This is a small crewel kit designed by Barbara Jackson, and you can read all about it here. I loved working these little crewel kits! They’re small but oh-so-satisfying! 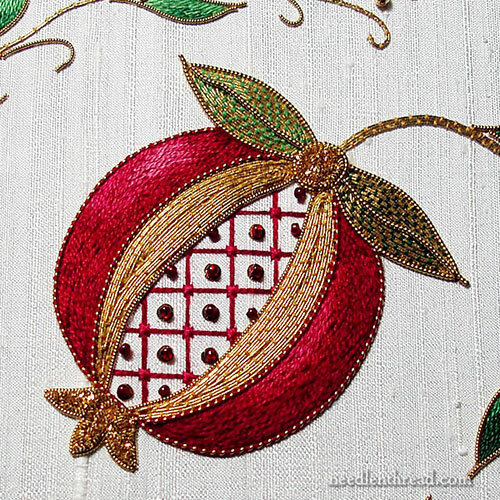 There are a few stylized pomegranate embroidery patterns in my collection of free hand embroidery patterns here on Needle ‘n Thread. The one above can be found here – it’s a corner design that can be broken down to just one corner for a smaller project, or you can tackle the whole design with all four corners! And that, my friends, is your Pomegranate Tour! I hope you have a jolly weekend! Great seeing a tour of past pomegranates again, I actually embroidered the stylised goldwork pomegranate as part of my Niece’s wedding gift and it was great fun to do and really helpful following your tips and techniques I really enjoyed it. 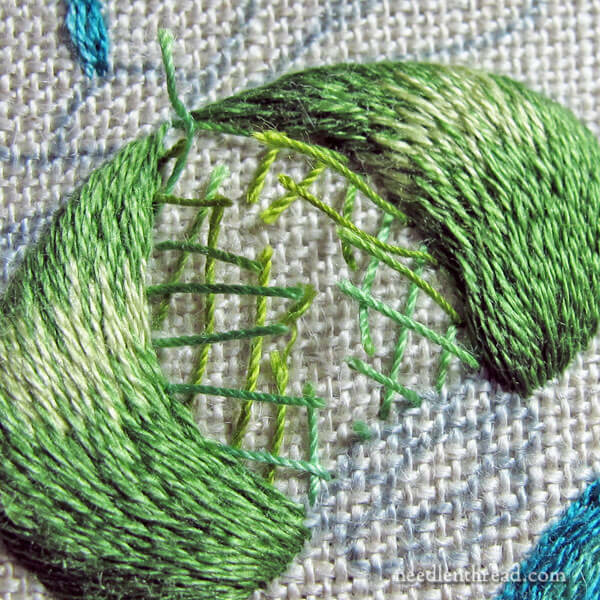 I really like you current pomegranate in Modern Crewel features project in green. I love lattice embroidery but sometimes end up spacing it wrong. 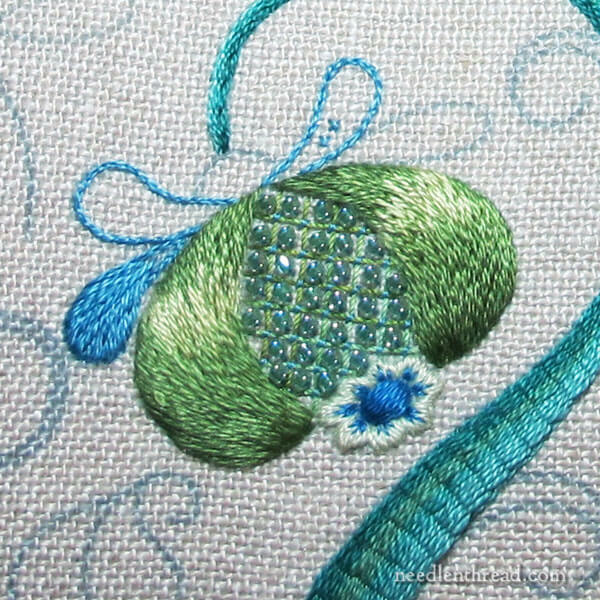 Thanks for sharing your tips and techniques with us on the lattice seeds and I hope you have a great stitching weekend. I really need to stitch Margaret’s pomegranate someday. Every time I see someone else’s take on it, I just gaze and gaze longingly (and probably drool a bit, too…). Oh, Mary, you’re an inspiration! Your work is incredibly beautiful!! I am also a sucker for pomegranates. It’s that pretty middle with the sides opening up to show it off! I love pomegranates, too! It was always a special treat to get one (and that’s all I got as a kid, one per year). I don’t embroider and have yet to find a pomegrante cross stitch pattern that speaks to me. I adore the Margaret Cobleigh one, though, and have used a photo (yours?) of it as my google profile pic for years. I love the pomegranate too! If I ever finally decide to get a tattoo, I want a pomegranate. But your stitched ones are lovely too. Some say that the “forbidden fruit” in the Garden of Eden was actually a pomegranate, not an apple. Such an ancient, evocative, rich symbol! Beautiful embroidery! Your web-page is the first that I have seen the Pomegranate pattern worked, And I can see why you like it so much. It is a design that would look great worked up any way it can be. I do appreciate embroidery work from centuries past, I can see why the Pomegranate is still popular. It’s design is simple and symmetrical. Some day I would like to work that pattern into a small table cloth. Your Pomegranate on the Modern Crewel Kit looks great. Your work is very inspiring. This week end I’m going to try to work on my petti point. I know exactly when your concluding pomegranate was published on your site, Jan. 4, 2011, as it is what comes up when I go to the bookmarked site for you. I always intend to stitch that pattern & think I will be reminded before scrolling to a current post from needlenthread. It’s a little like leaving a few WIP needleworks on surfaces throughout my home rather than storing in closet or drawers. Out of sight tends to shift priorities to something newly started or an impending deadline. Thanks for continued inspirations, and healthy wishes for your new year. I do love the Margaret Cobleigh design. I love the colors, I love the shading, I love the seeds. Now that’s a Golden Pomegranate. Lattice, I always have to do it twice. Arghhh.